Three major themes recur throughout the plan: The push toward competition rather than building community and relationships; the individualization of systemic inequalities; and the criminalization of our young people as we expand the School To Prison Pipeline (STPP). 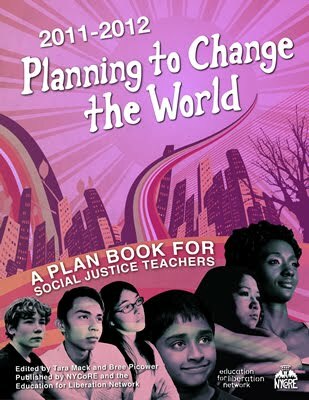 · Competition: The plan begins with a call for “access to high quality education for every child in every neighborhood.” However, the plan itself, with proposals like a city-level Race to the Top, merit pay, and performance contracts for each school, sets up a system of punishments and rewards based on pitting students, teachers, and schools against each other. · Individualization: Plans like a parent-teacher contract agreement and performance contracts push “individual accountability” over mutual responsibility and relationship building (with no discussion of how those at the top of the system will be held accountable). · Criminalization: The proposal to revoke the driver’s licenses of youth who are pushed out of the school system criminalizes those young people who rely on driving to transport themselves and their families. We are also concerned by Rahm’s references in public forums to “zero tolerance” in response to addressing queer bashing & bullying in schools. But, What’s He Really Saying? Autonomy? : Rahm’s proposal for granting greater autonomy to the most successful principals also implies that unsuccessful principals will be placed under greater scrutiny and control. Who will have the power to decide which are the successful and unsuccessful school leaders? And what does autonomy mean? According to the plan it means principals will have the freedom to “purchase services” for their school. We wonder if this refers to the basic programs and services that all children deserve, but due to cutbacks and funding inequities, so many schools lack—Deprived of resources that were once part of the public good, would schools then be granted the “freedom” to pay private contractors to replace them? Parent/Community Voice? : There’s plenty of talk about increasing parent & community voice, e.g. providing “simplified versions” of school report cards to parents and introducing the “parent trigger” to shut down or turn around “failing” schools. What is not mentioned is the fact that school report cards are already public record, which begs the question: Who will be simplifying these documents for parents and why? Also blatantly absent from this plan is any mention of Chicago’s Local School Councils, which are meant to act as an avenue for parent and community voice in schools and already have the power to remove ineffective school leadership. We fear the parent trigger is an invitation for charter schools to market themselves to parents in schools that have been denied the resources to succeed. Nor does the plan address the need for student voice. If students are meant to be at the center of our education system, why are they not included in decision-making about the future of their schools? Working w/ Teachers? : Perhaps the most perplexing claim is that Rahm will “work with the teachers’ union.” Considering that there are no union members or representatives on Rahm’s education transition committee, as well as his vocal support of union-busting legislation, the reality is that there is no voice for teachers in his plan. Attacks on teachers’ unions are especially scary when we consider the broader context of recent events in Wisconsin and attempts to dismantle public workers’ unions around the country. Rahm speaks to our common sense by addressing real problems in the school system: high “dropout” rates (school push-out), barriers to parent voice and community involvement, lack of access to learning that fosters critical thinking, and so on. Unfortunately, his solution is to further corporatize the education system. Rather than drawing on local knowledge and community perspectives, Rahm’s plan seeks top-down fixes. In addition, Rahm’s vision for education situates the students and families who rely on public schools as consumers: If you’re unhappy with your school, take your business elsewhere. We do not want to live in a city of top-down leadership & consumer-citizenship; we want to live in a city that invites us to participate in the creation of those institutions that affect our lives. It’s clear that as educators committed to just, relevant and equitable schools, which are engaged in and responsive to our communities, we will be facing an array of challenges, both old and new, with the coming administration. To get updated on TSJ actions and events, make sure you are signed up for the TSJ listserv (email teachersforjustice@hotmail.com), check out our get involved page for information on different TSJ projects and committees, and connect with us on Facebook. I do nor understand the fight before the decision, most teachers do not live in our community, which is not the case for other City employees, other are short term residents, leadership for more than school are important, but school are first, I do suggest too it be evaluate but not necessary in advance to understanding the leadership. TSJ I believe is a meaingful organization, so we have to look at the real truth are all the teacher from the City as well, because other than issues other than ocassion conflict in Suburban schools, this is totally a conflict to deal with inner city issues and we support you opinions but have to draw the line to those who are speaking for thier gain and this is not necessarly teachers and principal's who do their job I feel they show be speaking to these Issues where are they.